Denmark won the 1992 championship. The team had qualified only after Yugoslavia was disqualified as a result of the breakup and warfare in the country. Eight national teams contested the finals tournament. Also present at the tournament was the CIS national football team (Commonwealth of Independent States), representing the recently dissolved Soviet Union whose national team had qualified for the tournament. It was also the first major tournament at which the reunified Germany (who were beaten 2–0 by Denmark in the final) had competed. On 16 December 1988, Sweden was chosen over Spain to host the event, following a decision made by the UEFA Executive Committee. Spain was at a disadvantage as they had already been chosen to host the EXPO 1992 and the 1992 Summer Olympic Games. Seven of the eight teams had to qualify for the final stage; Sweden qualified automatically as hosts of the event. The Soviet Union qualified for the finals shortly before the break-up of the country, and took part in the tournament under the banner of the Commonwealth of Independent States (CIS), before the former Soviet republics formed their own national teams after the competition. The CIS team represented the following ex-Soviet republics: Russia, Ukraine, Belarus, Kazakhstan, Uzbekistan, Turkmenistan, Kyrgyzstan, Armenia, Azerbaijan, Moldova, and Tajikistan. Four out of 15 ex-republics were not members of the CIS: Estonia, Latvia, and Lithuania did not send their players; Georgia was not a member of the CIS at the time, but Georgian Kakhaber Tskhadadze was a part of the squad. Originally, Yugoslavia qualified for the final stage, but due to the Yugoslav wars, the team was disqualified and their qualifying group's runner-up, Denmark, took part in the championship. They shocked the continent when Peter Schmeichel saved Marco van Basten's penalty in the semi-final penalty shoot-out against the Netherlands, thus defeating the defending European champions. The shock was compounded when Denmark went on to defeat the reigning world champions Germany 2–0 to win the European title. ^ From 1960 to 1988, Russia competed as the Soviet Union. ^ Replacing the Soviet Union. ^ Replacing Yugoslavia, who were subject to sanctions under UN Security Council Resolution 757 and thus banned from appearing. Each national team had to submit a squad of 20 players. Adidas Etrusco Unico was used as the official match ball of the tournament. The ball was previously used in the 1990 FIFA World Cup. Results. Yugoslavia (stripes) qualified, but were banned and so replaced by Denmark. CIS (yellow on the right side of the map) qualified as Soviet Union. There were 32 goals scored in 15 matches, for an average of 2.13 goals per match. Small is Beautiful was the official slogan of the contest. The official anthem of the tournament was "More Than a Game", performed by Towe Jaarnek and Peter Jöback. It was the last tournament to use the UEFA plus flag logo, and the last before the tournament came to be known as "Euro" (it is known as "Euro 1992" only retrospectively). It was also the first major football competition in which the players had their names printed on their backs, at around the time that it was becoming a trend in club football across Europe. ^ Chowdhury, Saj (12 May 2012). "Euro 1992: Denmark's fairytale". BBC Sport. British Broadcasting Corporation. Retrieved 11 June 2012. 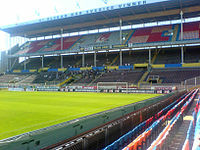 ^ a b "Sweden to host 1992 Euro finals". New Straits Times. Reuters. 18 December 1988. Retrieved 16 September 2014. ^ Hughes, Rob (16 October 1991). "Now, the going gets tough". The New York Times. Retrieved 16 September 2014. ^ a b Hughes, Rob (10 June 1992). "Confidence and flair: Dutch favored in Euro 92". The New York Times. Retrieved 16 September 2014. ^ "Yugoslav athletes banned". The New York Times. 1 June 1992. Retrieved 16 September 2014. ^ Thomsen, Ian (23 June 1992). "Danes upset Dutch in penalty shoot-out, advance to final". The New York Times. Retrieved 16 September 2014. ^ Thomsen, Ian (27 June 1992). "Upstart Danes upend Germany, 2–0, in soccer final". The New York Times. Retrieved 16 September 2014. ^ "United Nations Security Council Resolution 757 (Implementing Trade Embargo on Yugoslavia)". UMN.edu. United Nations. 30 May 1992. Retrieved 18 August 2008. ^ "European Football Championship 1992 FINAL". euro2000.org. Union of European Football Associations. Archived from the original on 17 August 2000. Retrieved 26 December 2017. ^ "Player statistics – Goals scored". Union of European Football Associations. Retrieved 18 June 2012. ^ "1992 team of the tournament". Union of European Football Associations. 17 October 2011. Retrieved 17 June 2012. ^ Kell, Tom (1 February 2013). "The weird and wonderful world of Euro mascots". UEFA.com. Union of European Football Associations. Retrieved 5 April 2015. Wikimedia Commons has media related to UEFA Euro 1992.